(T.3b) FE 5 81 on 2c orange CC wmk (SG.127). 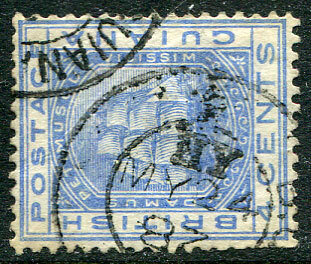 on 1876 4c blue CC wmk (SG.128), diagonal bend. 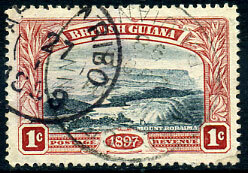 (Proud D1 although his illustration thoroughly incorrect) dated HY/MY 24 82 (the year "2" being inverted) on DLR 4c blue CC wmk (SG.148), the instrument excised leaving wording "B. GUIANA" at about 2 o'clock (compare with GEORGE-TOWN D19, Proud Page 93). 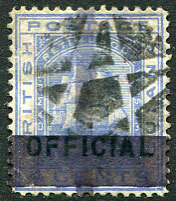 Part of a differing narrower double ring handstamp alongside. (T.6c) 10 OC 88 on 2c orange CA wmk (SG.171). 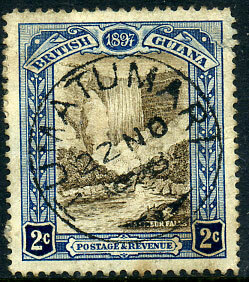 (T.11) 22 NO 1898 on 2c Falls (SG.217). 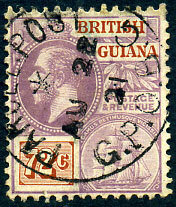 on 12c grey-lilac P.10 (SG.98). 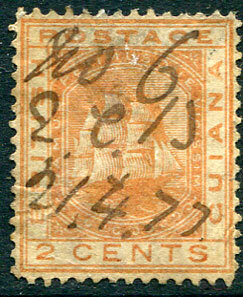 on 1876 2c orange CC wmk (SG.127). 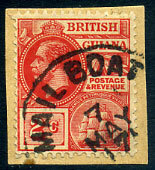 AU 6 without year on 2c orange CC wmk (SG.127). 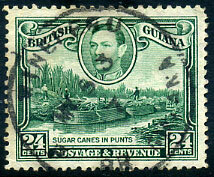 (T.12b) 6 NOV 1899 on 4c Inland Revenue (SG.178), toned. 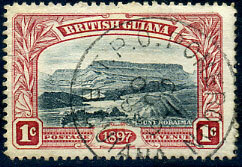 */19 JY 32 on KGV 4c (SG.285). 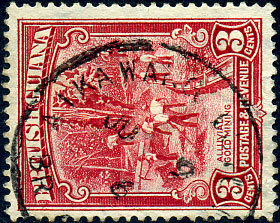 on 1875 2c orange OFFICIAL (SG.02). 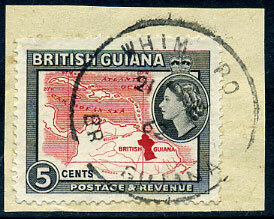 (T.5a) on 48c (SG.247, Cat.£48), rare on this. 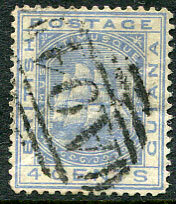 in blue dated SEP 1899 on 2c on 5c (SG.222). 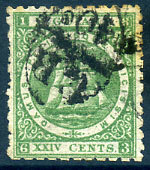 on 1871 8c pink P.10 (SG.95), some clipped perfs. 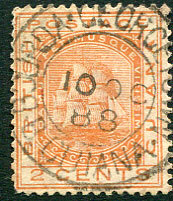 (T.2) dated 8 MAR 1881 on 2c orange CC wmk (SG.127), stained perfs. 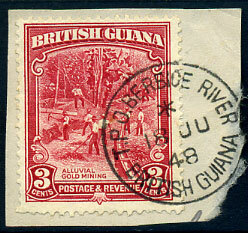 (T.5a) FE 22 88 on 2c orange CA wmk (SG.171). 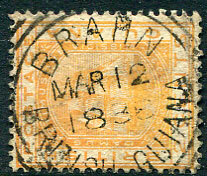 (T.2) part dated MAY 16 ---- on 1882 2c orange CA wmk (SG.171). 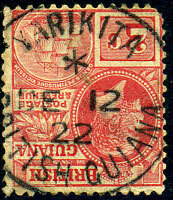 (T.2) part dated 24 A-- 1880 on 2c orange CC wmk (SG.127). 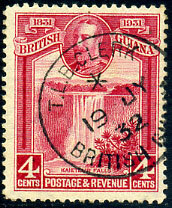 (T.5a) SP 5 87 on 2c orange CA wmk (SG.171). 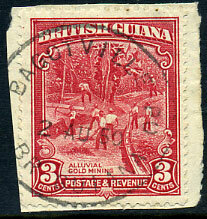 (T.2) SEP 2 1880 on 2c orange CC wmk (SG.127), corner perf. fault. 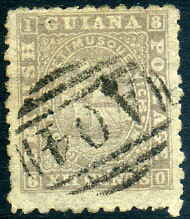 (T.21e) */DE 12 22 on KGV 2c (SG.273), perf. 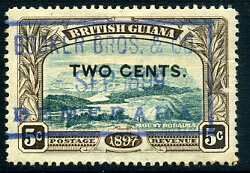 defects in two places, extremely rare. 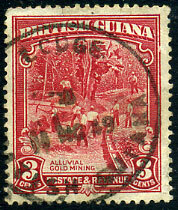 (T.31) 11 NO 49 on 3c (SG.290). 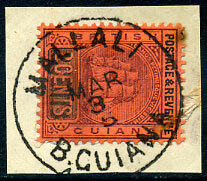 (T.8) FEB 12 1887 on 2c orange CA wmk (SG.171). 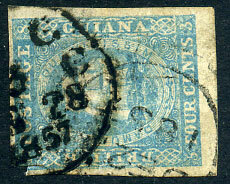 (T.12b) MAR 3 5 on 2c MCA wmk (SG.241), two tone marks. 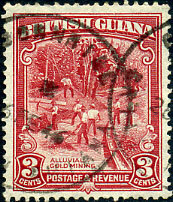 (C1) APR 11 1913 on 24c (SG.246), minor toning.